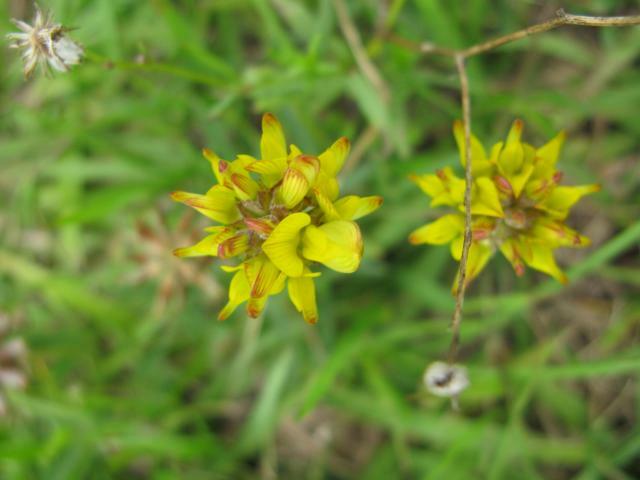 Amphinomia bainesii (Baker) A. Schreiber, Listia bainesii (Baker) B.-E. van Wyk & Boatwr. Lotononis (Lotononis bainesii Baker) is a perennial herb from tropical and subtropical regions, valuable for pasture due to its quality and tolerance to heavy grazing. 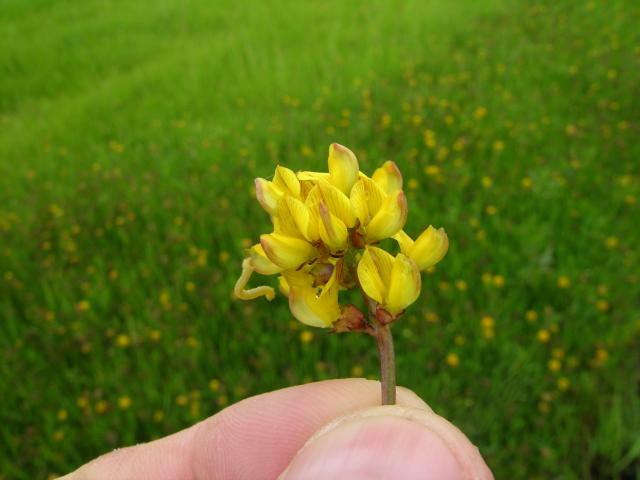 Lotononis bainesii is a stoloniferous perennial legume. It is strongly taprooted with many secondary taproots developing from the fibrous root system, starting at the stolon nodes. Lotononis has soft, slender, irregularly branched stolons, up to 1.5 m long. Lotononis can reach a height of 20-60 cm under light defoliation. Under intensive defoliation, it forms a low, dense mat. Young growths are finely hairy while older foliage is glabrous and shiny. Lotononis leaves are palmate, mostly trifoliolate (rarely with 4 or 5 leaflets), borne in groups of 3-5. Leaflets are thick, fleshy and mucilagenous when crushed. The central leaflet is longer than the others. 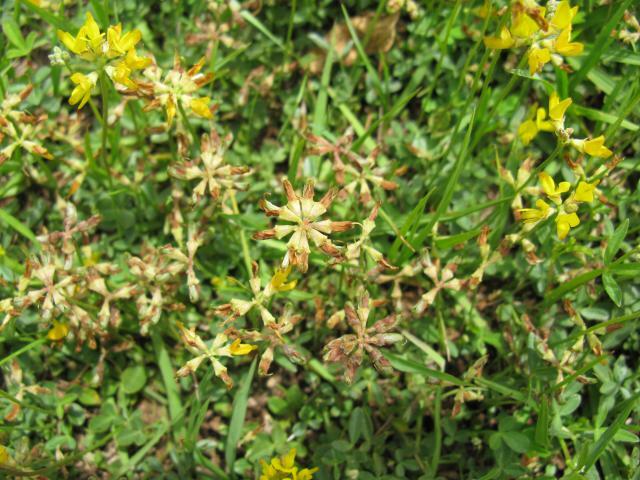 Lotononis flowers are borne on dense globose racemes of 8-25 yellow, papillonaceous flowers. The fruits are linear-oblong pods, 8-12 mm long, shattering at their base to release the seeds. Seeds are cream-yellow to light brown and very small (3-4 million seeds/kg) (Real, 2005; Cook et al., 2005). Lotononis bainesii is usually grazed in the subtropics, but can produce high quality silage without the addition of molasses. Lotononis can be a useful standover crop in cool areas due to its frost tolerance. Although lotononis is capable of forming a dense mat, its value for soil conservation is usually limited by its inconsistency of cover (Cook et al., 2005; Real, 2005). Recently, it was reported that in spite of early promise, lotononis had failed to persist in the long-term, resulting in a loss of interest in it (no seed has been commercially produced in Queensland since 2004) (Jones, 2014). Lotononis bainesii is native to Southern Africa (Botswana, Mozambique, Namibia, South Africa) (Cook et al., 2005). It was introduced into tropical and subtropical areas of Australia, China, Fiji, Kenya, Mauritius, and Zimbabwe. It is found between a latitude of 20 and 34°S, in grassland and open woodland, in marshes and along river banks in the tropics, and on roadsides and other disturbed lands in the subtropics (Cook et al., 2005). It can be found from sea level up to an altitude of 600 m, and in places where annual rainfall is as low as 250 mm. It is, therefore, better adapted to drought-prone areas than greenleaf desmodium (Desmodium intortum) (Cook et al., 2005). Lotononis does well in places where annual rainfall ranges from 600 to 1600 mm and where average annual temperatures are 15-18°C. It grows on a wide range of soils, particularly infertile ones with low levels of P and Mo. 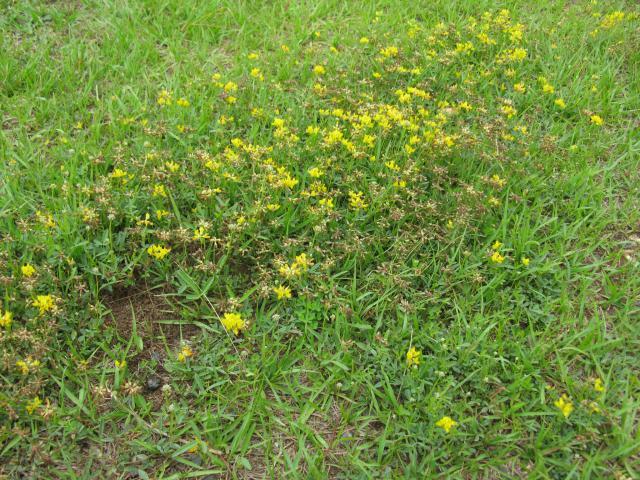 It prefers well-drained soils such as gravelly, sandy and loamy ones. Lotononis is poorly adapted to heavy cracking clays and performs best in soil with a pH ranging between 5 and 6. It has little tolerance of salinity but can withstand soils containing Mn and Al. Lotononis grows better during spring and autumn and stops growing when temperatures are below 7.5°C. It can survive some frost, down to -6.5°C (Cook et al., 2005). Lotononis can be planted vegetatively or from seed, preferably during autumn. Because the seeds are very small they should be broadcast at 0.5-1 kg/ha at a depth of not more than 5-6 mm on a well-prepared, firm and clean seedbed. Establishment is slow because seedling vigour is low (Cook et al., 2005). Lotononis mixes well with a number of grasses such as Paspalum commersonii, Paspalum plicatulum, Paspalum dilatatum, Digitaria decumbens, and, if they are frequently defoliated, with taller grasses such as Setaria anceps. Lotononis does well with winter crops such as annual ryegrass, oats and triticale (Real, 2005). When lotononis is grown in a mixture, the competition with companion species should not be too strong as this will prevent rooting by stolons growing from the nodes, which is detrimental to stand longevity. It is also possible to grow lotononis in pure stands for rotational grazing (combining 2 weeks grazing with 4 weeks rest) or for cutting at 8 week intervals (Cook et al., 2005). Lotononis yields well when inoculated with its specific Rhizobium strain. In Queensland, lotononis harvested after 4 months growth yielded 1.85 t DM/ha (Real, 2005; Cook et al., 2005). Dry matter yields may reach 2 to 8 t/ha, with most growth occurring at the beginning and end of the growing season. In very dry years, production may practically cease (Ecocrop, 2014). Close grazing is recommended to secure stand persistence, as it encourages runners to root. On the contrary, light grazing allows the plant to form a deep sward and rely only on its taproot, preventing development of new roots. Deep swards of old taprooted plants retain more moisture and are more sensitive to leaf and root diseases, which may accelerate degeneration. Under heavy grazing, lotononis makes new roots and the stand remains short and is healthier. Under cutting management it was shown that a lotononis stand had the highest yield (6.7 ton DM/ha) when it was closely cut, at a height of 3-5 cm (Cook et al., 2005; Risso et al., 2004). Lotononis bainesii is an excellent species for deferred feed because it remains leafy for a long time. In autumn and winter, its greenness and frost tolerance is particularly valuable. However, under severe frost, the foliage burns and turns black, disappearing into the ground after rain. Lotononis is, therefore, unsuitable as a deferred forage for winter grazing in cold regions (Real, 2005). No information was found on lotononis hay (December 2014). Good quality silage can be made from lotononis cut at 2.5-4 cm above ground and chopped without the addition of molasses (Catchpoole, 1970). Lotononis silage had a satisfactory pH (below 4.2), low concentrations of volatile components, and little loss of DM and N during storage. The final silage had 25.6% dry matter with 15.37% protein on a dry-matter basis (Real, 2005). 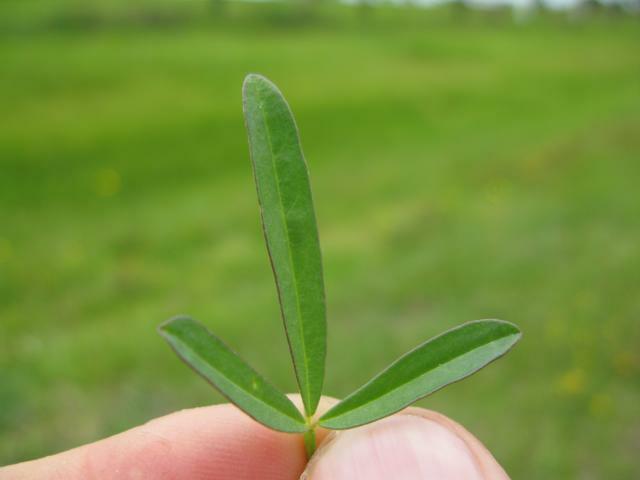 Lotononis bainesii is comparable with alfalfa in nutritive value. Its protein content ranges from about 9 to 26%, depending on time of year (flowering, etc. ), age of regrowth and vigour of the plant, but it is commonly in the high end of the range. Levels can be improved through an application of superphosphate. Sodium content is higher than in many tropical legumes. Calcium levels in a well fertilised stand ranged from 0.6 to 0.7% of the DM, and P levels from 0.3 to 0.4% (Cook et al., 2005). No toxicity has been observed with lotononis, although the lush growth could cause a temporary taint in the milk of dairy cows grazing it (Wright, 1964; Cameron, 1985 cited by Real, 2005). Information about the nutritive value of lotononis for ruminants is almost non-existent. There is evidence of it in pastures trials, but only as a minor component. It is likely that the lack of commercial interest in lotononis has resulted in a lack of research. However, lotononis was reported to be highly palatable, though cattle and sheep appeared to need a short period to get accustomed to it (Wright, 1964). The only reported OM digestibility value is 61% (corresponding to a ME of 8.7 MJ/kg DM) (Milford, 1967). Risso, D. F. ; Cuadro, R. ; Reyno, R. ; Real, D. ; Zarza, M. ; Zarza, A. ; Urrestarazu, A. ; Llovet, P., 2004. Visita guiada sobre Lotononis INIA Glencoe. Serie de Act. de Difusión No. 393: 7-8.